Good Bye 2017 and Welcome 2018! Sorry for long silence...... But, We are still alive...! Hope to you can check our new material Soon!!! Happy New Year for All Metal Heads. Greetings and Latest Info from Ethereal Sin here! We finished making songs and started recording for new Album!!! Maybe You can listen it soon! Keep the Black Flame Burning at 2017!!! Happy HALLOWEEN with Our Video Clip!!! At last, Our First Public Video Clip is Here! This Song is "With My Izuna (2015 Ver)" from Our Best Album - Forbidden Chronicles. Check it by all means and HAPPY HALLOWEEN!!! Ethereal Sin is Winner of Metal Battle Japan 2015!!! WE got Victory!!! Below is a Message from Yama. One of my Dreams come true. I got really fantastic experience at yesterday. Wacken is my target since when I restart my band at Tokyo, 2007. I really appreciate to my band members and supporting families. I can't find proper words for my feeling. However, This photo is eloquent. Now, I know, It's not Goal. It's Start! We'll try to best for Japanese Elegiac Black Metal to Wacken!!! At last, I would say Great Thanks for you guys. I was helped by your message again and again. Thanks a lot! Keep the Black Flame Burning!!!! We got the qualifications to compete in the finals of METAL BATTLE JAPAN 2015. Aim to Wacken Yeaarrgghh AGAIN! FLYER is Here! and Chinese Mongolian Folk Metal Core band - EGO FALL! It's Include Beijing/China, Taipei/Taiwan, Osaka-Nagoya-Tokyo x2/Japan! This is our first tour with New lineup. from our Brother band " Dark Mirror ov Tragedy "!!! Keep the Black Flame Burning! 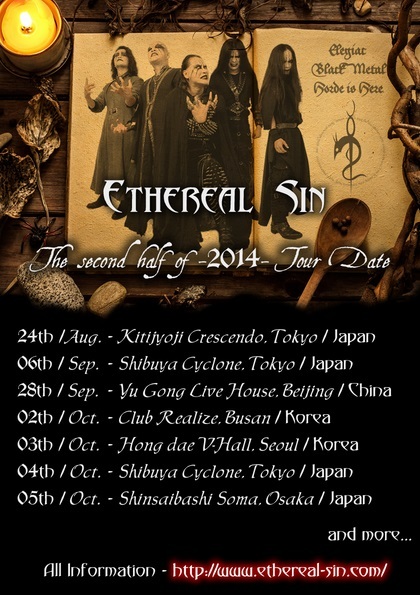 Greetings and New Member news from Ethereal Sin here! New Drummer - Leon Magatsuhi joined! He is from Crucified, Bereaved and more. and Morgan la Fay is Back for New FemaleVo & Key! Keep the Black Flame Burning at 2015!!! Today, We must announce such a sad news. will left the band by personal problem. Their last play will be at 25th/Jan/2015 Marduk Support. Successor members are already confirmed. We'll announce near the future! But,now, We must say farewell to them....Thanks a lot! and Keep the Black Flame burning!!! We will release New Material at Oct/2014. This Album is Split with our Brother band - Dark Mirror ov Tragedy. It's tentative named "Arcane of Ancient Abyss" incl 12 songs(2 Inst). and We got Interview for Japanese Fans with DMOT! We are glad to announce this news! This is First Time in Asia. We can accept to reserve 1Day/2Day tickets. Let's contact us and join this festival!!! 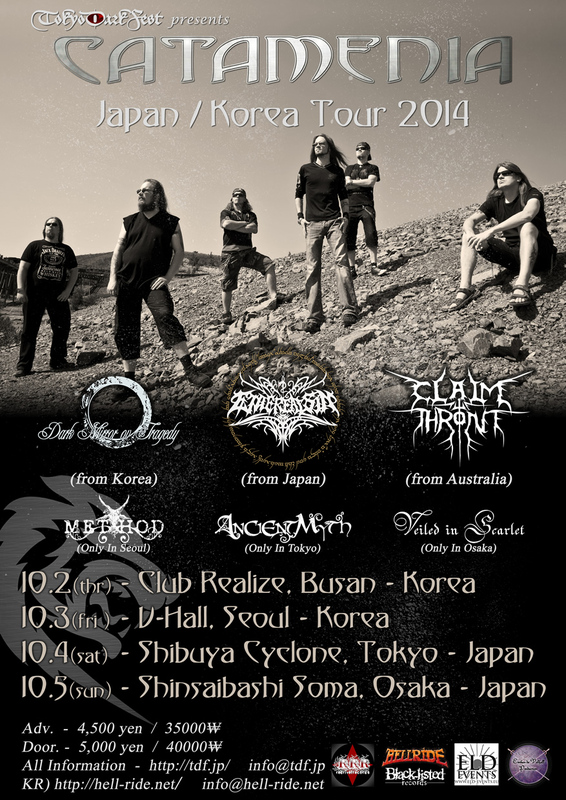 Ethereal Sin - Tour Date Up! Today, We update our tour date at the second half of 2014! This date is including our first time in China! and with Catamenia, Claim the Throne and Dark Mirror ov Tragedy. Then Swedish legendary death metal - ENTOMBED.A.D! We hope to see you guys at each venues! We started making new material. Therefore, there is no scheduled live for a while. Please looking forward to the reunion! We got a Management Contract! We have agreed to the management contract with B'n'F Productions. They are a really respectable great promoter of Japan. Check their web site and hope to all the best! New Year Message from Ethereal Sin here! in 2013 was very active&hard years for us. We had 17 gigs incl 3 tours.We had member change. and We released 2nd Full-length Album - Millendium! Really Heavy and Hot Year. BUT! 2014 will be more Exciting Year!!! with New EP and Some Tour in Some Country. At last, Our New Album - Millendium has been released!!! Amazon Japan and Some Real CD Shop!!! We hope that all listeners will enjoy it, Thx! Our Newest Member Shot since Aug./2013 is Published! "Ethereal Sin - Aug./2013"　Check It by all means! Ruines ov Abaddon, Tempest Rising and more local bands is finished! great promoters all tour supporters and you guys!!! We love it! See you again Absolutely!!! P.S. If you guys shoot our photo,video and more...contact us! We are ready of New Album - Millendium 's sample Trailer!!! by all friends/fans from FB. and Check it by all means! New Album will release SOON!!! We signed Red Rivet Records for our new album - "Millendium". It will be release on 20/Sep/2013!!! Don't miss It! 2 New Support members are coming!!! New Keyboard - Professor TF. They will play the Next time gigs(21/Aug.2013). Hope to see and Enjoy!!! Unfortunately,The Wind of Changes blow here. Morgan le-Fay and Band were talked about several problems. and On both agreement, She was decided to leave the band. Best wishes for here future success. and We got some supporting members for Live in the future! New Album Songs list is here! We have glad to that we can announce this information. Our New Album - "Millendium" song list is available. Total 15 songs.Mix/Mastering by Stefano/16th Cellar Studio. Please wait more Information and Hope to release!!! We finished MIX/MASTERING Our 2nd Album - "Millendium". Bloodshot Dawn etc...) Maybe, It will be release at July 2013. 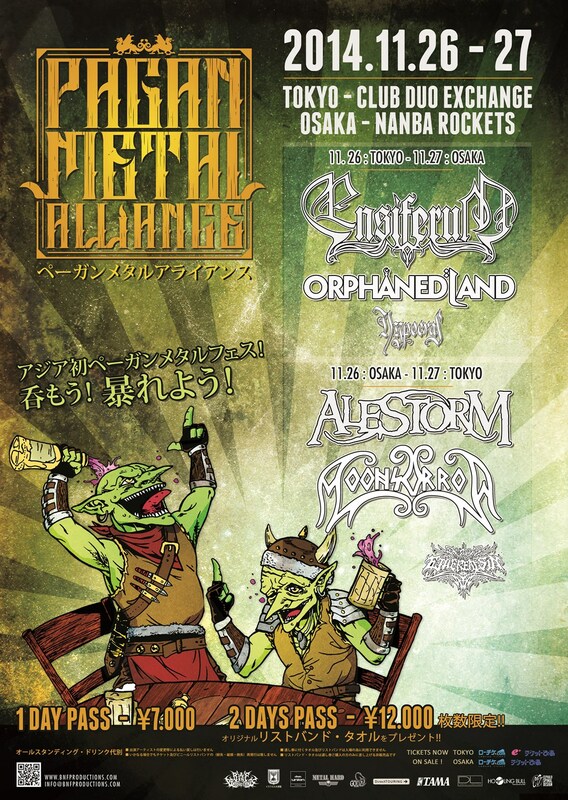 We got the qualifications to compete in the finals of METAL BATTLE JAPAN 2013 at second consecutive year. at SouthEastAsia named "Hammersonic" in Jakarta/Indonesia!!! As I Lay Dying,Destruction and more Great band together. See you guys and Let's drink with head-banging!!! 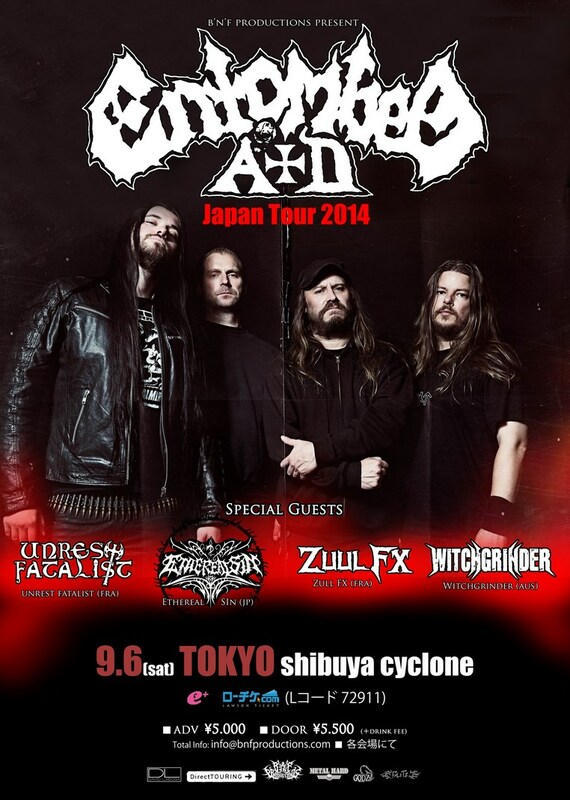 - MARDUK's Serpent Sermon Tour 2013 In JAPAN!!! This Tour Days are Sep.03 ~ Sep.08/2013. I know it's worth waiting!!! We will re-release our 1st full-length album at 2009.
named "The Abyss will also gaze into thee : ricordo"! This is New Year Message from Ethereal Sin! In This Year, We will release 2 materials. 1. re-Release our 1st Full-length Album on Feb.
2. Our 2nd Full-length Album on June. and have Some Tour Plan in Some Country. So, Keep Check our Information! Thx for Your Support and See you Soon!!! New Guitar - Kohen Join!!! Really Glad News is Here! At last, New Guitarist joined us! His Name is " Kohen Schnitter ". He had supported our live since Apr/2012. and Now He became an official member. Soon, His Photo will Upload. The Recording has been delayed. Hail All Dark fellow Soldiers. I must say Sorry to guys who are waiting our New albums. Our recording works has been delayed. 'cause this album's drum Engineer has changed. We were not able to smoothly contact him studio. It's too difficult and we were confused. So we had to stop our works. But now, New Engeneer is here. We resumed work. You can know any good news about this album sooner or later. so Please looking forward to finish this work! New Album's Title and Jacket published !!! Today, Ethereal Sin's New Album - [ Millendium ] 's Artwork/Concept published. Millendium means "End of The Millennium". - like Millenarianism of Christianity. It's for Freedom, Glory, Honor by Heathen have been oppressed. This Album will release on Jun or Jul 2012 ! We got the qualifications to compete in the finals of METAL BATTLE JAPAN. Sound Page in Whispers Section Updated. Now,You can listen Our Song’s Sample incl Demos! and Media Page in Words Section Updated too. Album reviews and interviews will be posted from time to time. and Other changes were made in several places. If You have any request, Let me by Contact Page in Senses Section by all means! New Member Shot is Here! for Promotion of New Album is ready to publish! Check It Now by all means! and for Promotion of New Album!!! These Photos will be published here SOON! To All of Dark fellow Soldiers! Happy Hellish New Yearrrghh!!! from Ethereal Sin. In 2011,We got really merciless and mournful disaster. Of course Member Changing couldn't forget too. But, There are New Black Metal Fest named "Black Sacrifice" in Japan. So We think...Our Future isn't only darkness. Well,Grateful to welcome the New Year along with everyone safe. and I'm looking forward to see you with New Album! Keep the Black Flame Burning with 2012!!! New Material - Live DVD released!!! named " Live at the Stormy Night"!!! at Sep/24/2011 - Koenji Mission's in JAPAN. Oct/17/2011 Our Bassist - Vlad Demogorgon left the band temporarily for his life. But, Seth Maelstrom(ex- our support Guitar) is joined in his place for New Bass. Our future war plan has no problem!!! Thx Vlad and Try the Best!!! ...and You can see that some pages has been updated. Member,Event and more...especially, Japanese - English Transfer Part build up. Plz check the site update will continue with Twitter,Facebook etc...!!! One Review of Our EP posted! One Review of Our EP "The Psalms of Forgotten Saga" posted! We are glad to welcome the New Year with our New EP. If you don't check yet, Check our Myspace ASAP! Lyrics Page in Words Section Updated. Now,You can read Our Song’s Lyrics! Video Page in Visions Section Updated. Now,You can watch Our Live Video and more! Forum and Contact Page in Senses Section Updated. Now,You can check our Discography and Live Schedule! Bio & Member Page in Spirits Section Updated. Now,You can check our Biography and Member Photos! at Last, our New Web Site launched! This design tone is for our New EP - "The Psalms of Forgotten Saga".